We’ve been getting that question a lot. And paraphrasing David Robinson: when you’ve written the same code 3 times, write a function; when you’ve answered the same question 3 times, write a blog post. There are a lot of ways to approach this question, and perhaps the simplest one is that data analysts are concerned with what has happened or is happening (the past and present) while data scientists focus on what will happen or what could happen (the future). The information technology research and consulting firm Gartner created an ascendancy model in 2012 to categorize different types of analytics into descriptive analytics, diagnostic analytics, predictive analytics, and prescriptive analytics. Descriptive and diagnostic analytics are the purview of the data analyst role. Descriptive analytics such as reports detailing what happened last month and dashboards showing real-time metrics are products that are commonly created by data analysts. Diagnostic analysis to determine why things happen under some conditions but not others (seasonality, correlation, etc.) can also be within the duties of a data analyst. Data analysts almost always work with structured data. 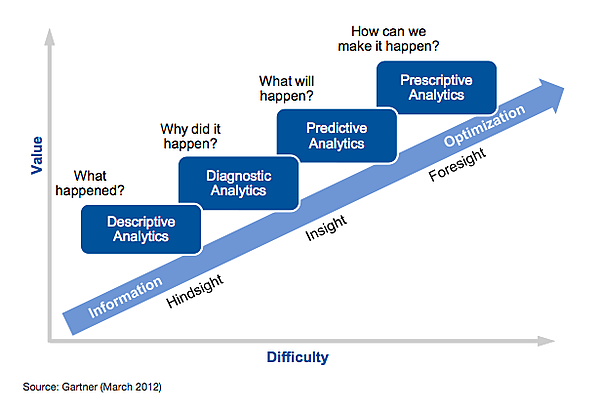 Predictive and prescriptive analytics fall most often to a data scientist. Using training data to build a model that predicts what would happen given certain conditions is an example of predictive analytics. With the development of software libraries like Python’s scikit-learn you don’t need a deep understanding of an algorithm to use it. However, without insight into what happens inside the algorithmic black box, explaining the model will be hard and of limited value. Because of this, an understanding of probability and inferential statistics is key for a data scientist. Prescriptive analytics is also usually the work of a data scientist. Prescriptive analytics is concerned with producing desirable outcomes or avoiding undesirable ones. Once a model has been built and influential variables have been identified, a data scientist may recommend changes that would more likely lead to a targeted outcome. Data scientists work with both structured and unstructured data. Both data analysts and data scientists are concerned with generating insight from data, and both use tools to explore and understand data. If you are interested in learning the tools of either profession, come to one of our Analytics + Data Science Info Sessions (second Wednesday of each month) or sign up for one of our Analytics Jumpstarts (planned for February, April, June, August, and October).